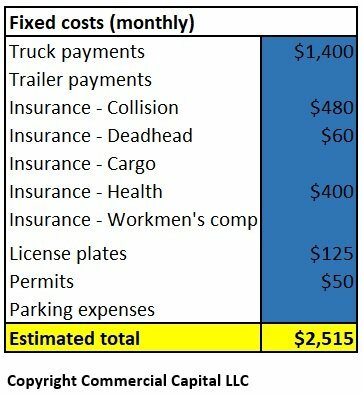 One of the most important things you can do before you start your trucking business is to estimate your “all-in” cost per mile. Knowing this cost, along with estimating how much you will make, enables you to estimate your expected profit. Profit is your most important number. Your profit is how much you keep, after paying all expenses. This article is intended for beginning owner-operators. It includes a spreadsheet that you can download and use to estimate your own expenses. Get the spreadsheet here. The most important number for this calculation is the total number of miles that you will drive in a given month. This number of miles includes compensated miles and deadhead (not compensated) miles. The spreadsheet and following examples assume that the average trucker drives around 8400 miles per month. Obviously, this mileage varies by owner-operator. However, most owner-operators report driving around 100,000 miles a year. Fixed expenses are expenses that stay the same from month to month regardless of how many miles you drive. For example, truck payments are considered a fixed expense. They stay the same regardless of how many miles you drive. Insurance, license plates (IRP), and many permits are also fixed expenses. This table shows an example of possible fixed expenses for a startup owner-operator. As you can see from the list, most fixed expenses are straightforward and easy to calculate. Some costs are paid yearly as a single payment, rather than monthly. For example, license plates are usually paid once a year. We estimate a yearly cost of $1,500, which equals $125 ($1,500 / 12 = $125) per month. This method helps estimate the “all-in” cost per mile more easily. Variable expenses are the direct costs associated with driving every mile. They increase and decrease based on the number of miles you drive in a given month. For example, fuel is a variable expense. You need to buy fuel for every mile you drive. If you drive more miles than usual in a week, your fuel costs will increase proportionally. And if you don’t drive any miles in a given week, you won’t have to pay for fuel that week. Examples of variable expenses include fuel, meals, telephone, tires, maintenance, and so on. 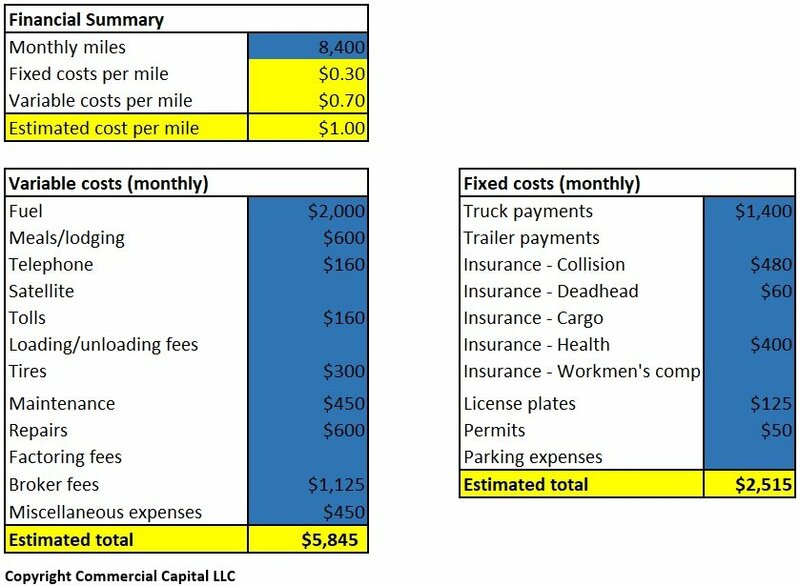 The following table shows examples of variable expenses for an owner-operator. Notice that the two highest variable costs are fuel and broker fees. Decreasing fuel costs and working to replace brokers with your own clients both lead to lower variable costs (per mile) and higher profits. The last step is to put everything together. Using the number of miles, the monthly fixed costs, and the monthly variable costs we can calculate your costs per mile. To calculate the “cost per mile,” divide the cost by the number of miles you drove that month. For example, “fixed costs per mile” is calculated by dividing $2515 (fixed costs) by 8,400 (miles), which gives us $0.30 per mile. Using the same method, we calculate variable costs to be $0.70. Adding both numbers provides a “total cost per mile” of $1.00. One important detail to notice is that – because your fixed costs don’t change – your “fixed costs per mile” decrease as the number of miles you drive increases. Your “variable costs per mile” tend to stay the same regardless of the number of miles you drive. The following tables put everything together and provide a summary. 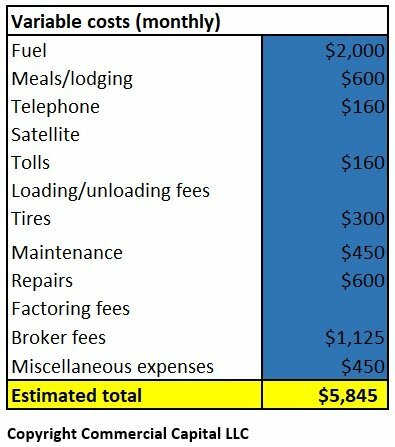 Using this information, we determine that, if you drive 8,400 miles per month, getting $1.00 per mile will allow you to meet all your expenses. Every cent above $1.00 becomes your profit. Consequently, if you charge $2.00 a mile, you would make a profit of $1.00 per mile. The most effective way to increase your profit is to reduce your highest variable costs. In the above example, the two highest variable costs are fuel and broker fees. You have some control over those costs, which can have a substantial impact on your bottom line. One of the major mistakes that new (and experienced) truckers make is thinking that the cheapest pump price (fuel + tax) is the cheapest way to get fuel. This is not always the case. Pump prices can be deceiving. Every time you get a load from a load board or a broker, you give away a portion of your profits. Pulling a load at a reduced price is better than doing nothing at all, if you charge enough per mile. So load boards and brokers can be useful if used correctly. Reduce your dependence on brokers/load boards and increase your independence by developing relationships with direct shippers. This approach is the only way you will make any decent money in the trucking industry. The only way you can successfully manage revenue and expenses is if you use accounting software. One great alternative is TruckBytes. They offer a base package at no cost, which is great for new truckers working on a limited budget. Truckbytes is owned and operated by the folks who run Learntotruck.com. Disclaimer: This information is provided for education purposes only. It should not be taken as business, financial, or legal advice. The examples reflected in the charts may not match your actual situation. « How Do PO Finance Companies Pay Suppliers?